This Quad Micro Bar is just one invention from its creator, Joe Warren. The nifty piece can be found on Pinterest as well as Coroflot. Once assembled, the four bar stool can be pulled out from the central table quickly and easily. If you don’t fancy all four seats out at once, the seats can be pulled out individually to suit your needs. This lightweight set is perfect for some outdoor drinks in the sunshine or as an indoor diner for some breakfast in the morning! 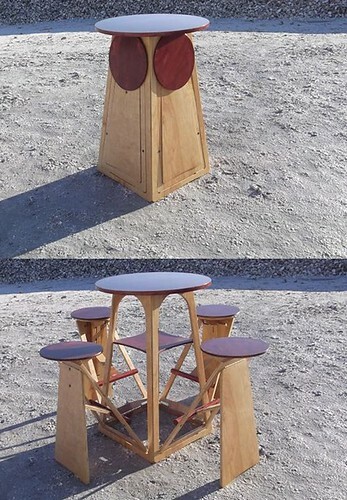 This stand out design by Orla Reynolds is modern, innovative and just a bit cool! As you can see, four brightly coloured chairs and two tables can be easily slotted into the handy storage unit from, as the name suggests, out of nowhere. The beauty of this design is that you don’t have to adjust or move anything on the shelves to make full use of the furniture as they each have their own little place within the design. 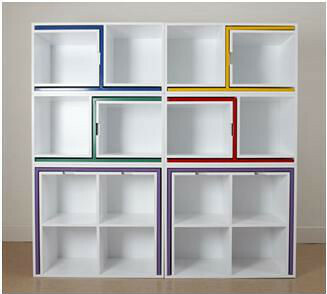 If that wasn’t enough, the white cubes can also be placed lengthways, upright or totally separate from one another depending on the size and layout of your room. 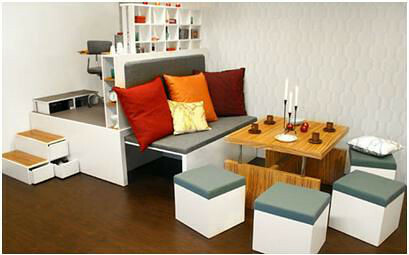 This retro coffee table/laptop table/book stand has already caught the eye of many style-loving bloggers on the net. We eventually traced the source of the item to Wayfair.com, at a retail price of $113.99 – not bad for such a one-off, special piece. The versatile table is available in walnut or black and white, which is very on-trend this season. This ingenious multifunctional kitchen design features a book shelf, a knife rack and a little chopping board/cheese board slot at the end. Created by the Australian designer, Toro Legno, the item can be found online on the designer’s own website. The beautifully carved wood is made from renewable plantation pine from Australia. 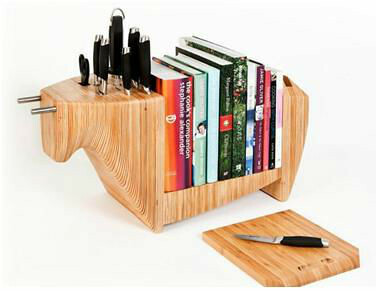 The Kitchen Bull is perfect for any culinary enthusiast and the durable wood will house your favourite cookbooks for many years. Go to the website to make a price enquiry. This one item from Swedish design company Matroshka is perfect for entertaining, dining, studying and even as a little place to have a nap during the day. The Matroshka team say that the versatile assembly of wood was inspired by Russian dolls which easily fit inside one another to save room. Based half up the Swedish coast in Sundsvall, this start up company are already ticking all the right boxes in the design world. Team great design with more great design by visiting an array of websites like http://www.lampcommerce.com/ to pick up some great designer pieces. 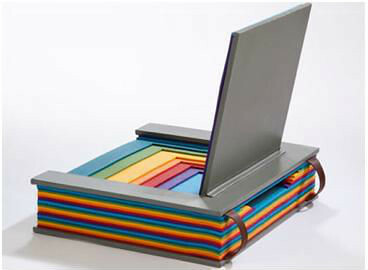 This design by Chen Lui demonstrates that great multifunctional design can be for children as well as adults. The low standing chair is fun and colourful and is sure to encourage kids to sit down and read a good book. Chen Lui is still exploring designs and materials so watch this space for more things to come!